Shuai Zhang, Best Poster Award for "Altered Self Assembly of 2D Protein Crystals at the Solid-Liquid Interface." Congratulations to Dr. Shuai Zhang at Pacific Northwest National Laboratory (PNNL) on receiving the best poster award at the 26th American Association for Crystal Growth's Western Section Conference on Crystal Growth & Epitaxy. The selection committee recognized his outstanding research and effective poster design. The poster is titled "Altered Self Assembly of 2D Protein Crystals at the Solid-Liquid Interface." Zhang's poster focuses on atomic force microscopy experiments that show how proteins assemble at the solid-liquid interface. Being able to directly visualize the diverse self-assembled structures of proteins and the pathways by which they form offers new insights into the design of interfaces between proteins and other materials. 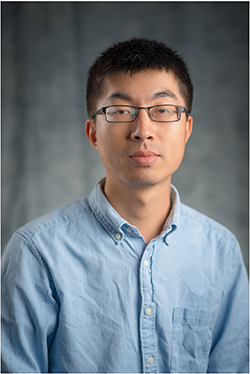 "The scientific challenge was to understand the competition between protein-protein and protein-substrate interactions, as well as protein entropy versus osmotic pressure," said Zhang. "The experimental challenge was to figure out the way to balance and control them to achieve ordered assembly." The research, part of a collaborative effort between PNNL and the University of California at San Diego, was funded by the Department of Energy's Office of Science, Basic Energy Sciences. "Zhang's excellent work reveals the unique controls that inorganic surfaces exert over protein assembly," said Dr. James De Yoreo, who mentors Zhang at PNNL. "Understanding and mastering those controls will impact the design of new materials, biomedical technologies, and our understanding of microbial systems." Dr. Peter Vekilov, who chaired the conference, announced Zhang's award at the closing talk. This honor capped off the 4-day event that Zhang spent meeting and talking with a diverse group about fundamental nanoscience related to crystal growth. The event took place at Fallen Leaf Lake, California from June 10 to 13, 2018.